a MBA in Management from Eastern University. She is an instructor and consultant of Restorative Practices and family and community engagement for a small nonprofit called “At Your Reach” that she founded in 2009. Kendra on the steering committee of 215 Peoples Alliance and coordinator of the Our City Our School coalition, she led parent advocacy and activism with Parents United for Public Education and is a supporting member of the Caucus of Working Educators. 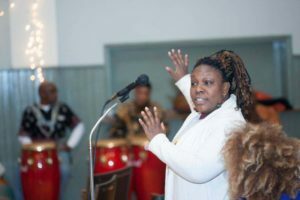 Professionally, she has conducted a wide range of trainings and family and community advocacy workshops in around the country as well as presented at regional and national conferences. Her activism spans education, social/racial justice and economics using restorative practices as a core value for systematic change. She has presented at political conferences, Universities, for the Federal Reserve Board of Governors, teacher unions and has spoken at numerous rallies and marches. Kendra is currently working on a family and community engagement model using restorative concepts to build community support for schools, neighborhoods and community based organization with plans to employ this experience working “Towards a Restorative City”.